Editor's Note: After poking around the Toys R Us Facebook page I saw that someone had called them to see what happens to the bikes that are brought in and she was told by Toys R Us that they are destroyed for safety reasons. So I just emailed them myself to find out exactly what the fate of these bikes are. I was hoping that the ones that are still in usable condition would be donated and the unsafe ones recycled. If they are all being trashed than I will no longer support this event and I will not trade in our bike. I'll just hand it down to one of our twins. I will update once I hear back from them. Last week the weather warmed up and we dug the boys' bikes out of the garage. We quickly realized that our 6 year old had seriously outgrown his. It makes sense since he has had it for 3 years now. So I began thinking about where to go for an inexpensive new bike and what kind to get him. Then this morning I turn on my phone and open my inbox to find an email from Toys R Us about The Great Bike Trade In. This totally made my day. 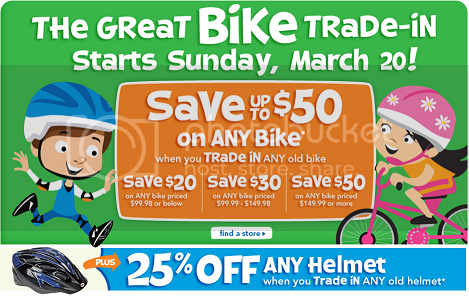 Sunday March 20, 2011 through Saturday March 26, 2011 bring your used bike in to a participating Toys R Us location and receive a coupon for up to $50 off the purchase off a new bike (details apply). In addition to that if you bring in an old bike helmet you will get 25% off the purchase of a new helmet. This is a great way to recycle your old bikes, though it's not clear what they do with all the old bikes that are brought in. We are going to be heading down to Toys R Us this week to bring in the old bike and helmet and let W pick out a new one. The coupon we will get plus a gift card he received for his birthday should make this a good deal for us. Toys R Us Great Bike Trade In details. Thanks, will have to check this out! They probably don't have the resources to check each bike, and don't want the liability of a used bike hurting someone. I would still support this because someone with a broke or unusable bike can get a great deal. If you have one that is still in good condition, I would give it to someone, like you mentioned, rather than use it as a coupon. Wish I would have seen this last week! We traded in our boys bikes just the other day :( Oh well, I know for next year. Penelope - I was actually thinking this as well today and I can understand it completely. However, I am hoping that they at least recycle the metals and plastics from the bikes rather than throwing them in a landfill. I am still awaiting a response. I hope they recycle them too! That's such a waste if they don't! Good for you for checking into how they handle the bikes! I hope they're recycling parts too; you'd think they would! I traded in my sons bike last week for a new one and I also asked what they did with the old ones and was told they are destroyed. my sons bike was also in good condition, i still dont see why they cant donate it to a national children center and they can check to see if they bikes are in good condition.